The Double Delight Rose. Fragrance And Stunning Beauty Combined. The Double Delight Rose is a Hybrid Tea Cultivar which was bred from the red and yellow Granada (a Hybrid Tea), and the ivory coloured Garden Party (also a Hybrid Tea). It has stunning, highly fragrant blooms up to 4 inches across, and it is a double, with around 30 petals. 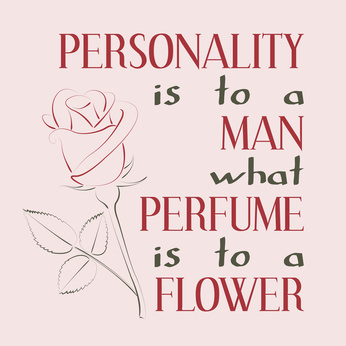 It has a fruity (citrus), spicy fragrance. I have smelled this rose and I can assure you it is divine. It will flower from mid to late spring (depending on the climate), right through summer and into autumn. It loves the sun and will be a real focal point of your garden. It is ideal for a front yard along the fence, where people can stop and 'smell the roses'. Double Delight will not disappoint in any way and it doesn't need any anything more than very basic care. Double Delight is a medium rose with long stems, growing from 3 feet to 5 feet high with a spread of about 2-3 feet. There is also a climbing form. It is a healthy, vigorous, prolific bloomer, never without a flower all season. The intensity of the colour will depend on the climate and its position. The more sun, the deeper the colour. So don't plant this rose in the shade if you want long-lasting, incredible blooms for both your garden and your house. It is, however, shade tolerant. You just won't get the intensity of the contrast in the blooms. It is also an excellent rose for a large container. And you can also buy this rose as a standard (either 60 cms or 90 cms high). Now that would look wonderful. As you can see, there is a striking contrast between the cream and 'carmine' to cherry red colour in this bi-coloured rose. The rose at the top of the page obviously does not get as much sun as the one above which has more red. The Climbing Form of Double Delight, above, has not really lived up to expectations, but it certainly is very pretty. It is not a very prolific bloomer, but I think that since it comes from the sturdy, reliable shrub form, it may be worth a try if you can find one. Caring For Your Double Delight Rose. A lot of rose growers say that this rose is susceptible to powdery mildew, but my son-in-law has grown it in his garden at work for a long time now, here in SE Queensland, where you would think it would get all sorts of diseases, but this one has never given him a problem. Hint: If you are worried about fungal diseases, this may help prevent them. Save all your tea leaves and put them around your plants. The lady next door to me always emptied her teapot onto all her plants and I wondered why. Now I know. Tea leaves are great at disease management. Tea bags are just as good, but they look better if you put them in the compost first. See the following site for more info. As they say, some tea bags are not compostable, however, you can discard the bag and use the tea. Gardening KnowHow. Double Delight needs well-drained soil, like all roses - they hate wet feet. To keep the soil moist enough, always mulch your Double Delight with good organic compost. This cuts down on watering time. (It used to be a bucket of water every two weeks for roses in general, and you can't go wrong with that, but you can give them that with the hose). On top of this, just add some good quality slow release organic fertilizer made especially for roses; this will ensure that you don't have to fertilize so often. Just follow the instructions on the packet. Most slow release fertilisers will cover you for several months, and some for up to a year (that's the kind I like). Roses are rather claustrophobic, so they should have plenty of air around them. This prevents diseases caused by humidity and encourages healthy growth. This rose should not be planted in a sheltered corner, and all roses hate wet feet, so never over-water. Also, roses in general tend to love the morning sun, but all day sun is even better. A very deep shade of red and cream. Lots of sunlight. It used to be a bucket of water every two weeks for roses in general, and you can't go wrong with that. So with the hose, Double Delight only needs a moderate amount, about twice a week, three times if you can manage it. It will survive on less, but don't over water. Companion Plants For Your Double Delight Rose. Lobelia erinus. The perfect contrast companion. When choosing companion plants for your Double Delight rose, think about which colour you want to complement both the red and the cream. The obvious colour for me is blue. Then you need to think about when the companion plants will bloom. 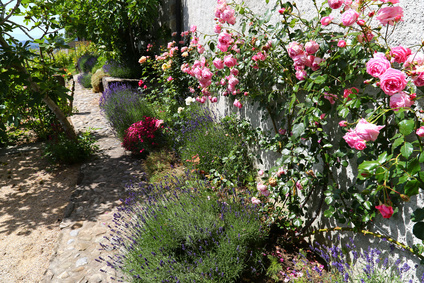 Perennials which bloom in summer are guaranteed to be in flower at the same time as your rose. Longer flowering plants are fine, but certainly not early spring bloomers (like Grape Hyacinths). These would look lovely, but they would probably flower well before your rose. The Lobelia plant, above, flowers in summer and will really show off your Double Delight Rose. Blue Salvia Will Add Height. 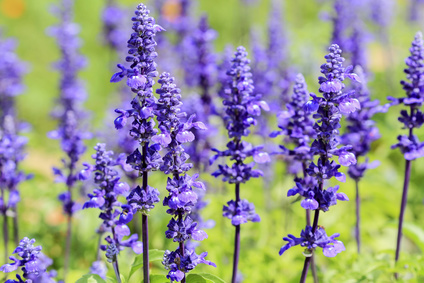 Blue Salvia shows off just about any garden plant, but looks especially stunning with the Double Delight Rose. 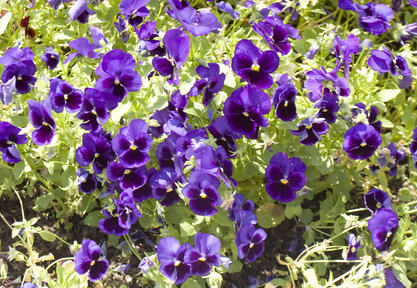 The Humble Pansy flower will show off your Double Delight Rose. Pansies flower from spring through to winter, depending on your climate zone. And they come in so many colour combinations. With their sweet little faces, they would look wonderful around the feet of your Double Delight Rose. Modern Roses. Hybrid Tea Roses.